Can people playing in a river help revitalize a struggling city? Can the recreational opportunities in and along a river actually improve the quality of life in and the public image of a city that’s lost its luster? The Three Rivers City is poised for an economic revival through two major projects that will answer a longstanding need: attracting outsiders. The Capital Regional Development Council, recently awarded a total of $10,000 to two separate initiatives aimed at reviving downtown Franklin. CRDC is proud to announce it recently awarded a total of $10,000 to two separate Franklin non-profit organizations through its Community Grant Program. The race course needed snow trucked in, but paddlers still made a go of the Boat Bash Snow Crash. Already known as a destination for whitewater kayaking on the Winnipesaukee River, Franklin is making a name for itself by hosting this unique downhill kayak race at Veterans Memorial Ski Area. In what is believed to be the only event of its kind in New England, some two dozen competitors went head-to-head Saturday in the second annual Boat Bash. The event was co-sponsored by the Franklin Outing Club and Mill City Park, the former having promoted community skiing in Franklin since 1961; the latter created in 2017 to promote the construction of a whitewater park on the Winnipesaukee in the downtown. Tim Morrill, who is co-president of the Franklin Outing Club and also a member of the nonprofit that is promoting Mill City Park, said he and Marty Parichand saw snow kayak racing on the internet, thought it would be cool to have in Franklin "and last year we did it." The 2018 races, like the inaugural ones, were held despite a paucity of snow and were a fundraiser for both the outing club and Mill City Park. Temperatures were in the mid-40s on Saturday and there were noticeable bald spots at the ski area, whereas last year, the weather was cold and the hill was icy. The side-by-side race course was given a couple long, swooping curves, said Morrill, while the original course was straighter, and bent only at the bottom so that several racers went off course and right into the ski lodge. The 2018 course was built at the last minute, said Morrill, with snow trucked in from parking lots all over Franklin. The ski area's groomer pushed the snow up and down the 550-foot-plus course and an excavator was brought in on Friday to shape the track; volunteers used shovels and rakes to fine-tune it. "It's beautiful," said Morrill, noting that the track was working well and giving racers an exciting ride. He added that the track is also unique: "It's the only one on the East Coast that we know of." Sam Durfee of Concord was named the overall winner of the Boat Bash and will receive outdoor equipment as his prize. Parichand, who is the executive director of Mill City Park and also a downhill kayak racer, said Franklin is increasingly on the radar of many whitewater enthusiasts because it offers the closest reliable rapids to Boston. Mill City Park, he said, is "re-envisioning the Winnipesaukee River as a whitewater mecca" and events like the Boat Bash Snow Crash help do that. There are 300 whitewater parks throughout the United States, Parichand said, 30 of them in Colorado alone, but there are none in New England, "and we're hoping to be the first one." This week, community members gathered alongside the Winnipesaukee River downtown to celebrate a project described as “transformative” for this former mill city, as two significant grants push the Mill City Park closer to reality. The project received a $180,000 grant from the U.S. Economic Development Administration and Franklin Savings Bank is donating $250,000. There are about 280 whitewater parks across the country, but this one will be the first in New England. More than that, says developer Marty Parichand, it is a catalyst that for boosting the city’s economy, generating $6.8 million of direct spending in the region. The river runs through the heart of downtown, which once fed mills turning out wool cloth, hacksaws and hosiery. Thrill seekers will head to the city to run the Class II, III and IV whitewater and entrepreneurs can catch the wave of the new economy on the rise. Projects like Mill City Park, Commissioner Taylor Caswell, of the Department of Business and Economic Affairs, told those gathered in Trestle View Park, will draw more than visitors; it will draw visitors who turn into residents, drawn by the lifestyle and the opportunities in the Granite State. Efforts to create New England’s first whitewater park got a double infusion of capital on Monday when Franklin Savings Bank pledged $250,000 and the Franklin City Council accepted the first portion of a $170,000 federal grant in support of the project. Marty Parichand, owner of Outdoor New England, a shop that sells kayaking gear, had founded the nonprofit Mill City Park to promote the development of a whitewater park on the Winnipesaukee River. The section of the river between Cross Mill Road in Tilton and Trestle View Park in downtown Franklin is a popular kayaking run, dropping an average of 77 feet per mile over the 1.25-mile distance. “Kayakers already know this river,” Parichand said, “but this will bring other people to see it, as well.” Parichand said he had been seeking a federal Economic Development Association grant for preliminary engineering, and found there was a $25,000 shortfall in funds. During Monday’s ceremony, Charlie Chandler, chairman of the Franklin Savings Bank Board of Directors, said the board voted unanimously to give $250,000 in support of the project, of which $125,000 would be immediately available. “This seed money will see that this project is transformative for Franklin,” Chandler said. Acting City Manager Judie Milner said the Franklin City Council formally accepted $129,870 in grant and matching revenues on Monday night. The money represents the portion of funding available from the Fiscal Year 2017 federal budget, with the remainder of the $170,000 grant to come from the 2018 budget, which started Oct. 1, once that budget has been approved. The federal grant will cover the cost of engineering, permitting, and survey work associated with the whitewater park, covering the lower 1,000-foot section of the river. A second phase would cover the upstream portion as far as Cross Mill Road. “They’ll be taking pictures of what the river looks like underneath to plan the features of the whitewater park in the correct spots, and also take care of debris in the river from the factories,” Milner said. The engineering work will use the strength of the river and the new features to create the volume needed for kayaking without having to adjust the flow level, she said. The take-out area will remain in Trestle View Park, but there will be stadium seating for spectators, she said. Franklin Savings Bank’s donation will support the construction of the whitewater park once the engineering is complete. “This is an opportunity to change the tide in Franklin through outdoor recreation,” Parichand said. “We’ll reinvent ourselves.” He said the project presents a combined solution to Franklin’s problems. Interim Mayor Scott Clarenbach supported that notion in his comments during Monday’s ceremony. “Today’s gathering is all about Mill City Park at Franklin Falls, which is writing a new and exciting chapter by reutilizing the power of Franklin’s beautiful rivers for another prosperous period in our community’s long history,” he said. Taylor Caswell, commissioner of the New Hampshire Department of Business and Economic Affairs, compared Franklin’s effort to the recent revitalization effort in Littleton, which used recreation as a way to redefine the community. “It is part of what we need as a state to attract new residents at a time when there are more job openings than there are workers,” he said. A century ago, the Winnipesaukee River powered the mills that were the city’s lifeblood. On Monday, it was announced that $180,000 in federal grant funds and a $250,000 donation from Franklin Savings Bank will help the city turn to the river again as an economic catalyst for the downtown. Plans call for the creation of a whitewater paddling park on the Winnipesaukee River. The U.S. Department of Commerce grant will pay for engineering and design work. The park is the brainchild of Marty Parichand, who runs Outdoor New England in Franklin, a shop that sells kayaking gear. He founded Mill City Park, a state-licensed non-profit to advance the idea. “What you’re going to hear today is a story of progress and a story of change and it’s very, very exciting,” Parichand told those who gathered to hear the announcement beneath a tent in Trestle View Park. The river drops more than 7.7 feet over a 1.25-mile section extending from Cross Mill Road in neighboring Tilton, to Trestle View Park, offering prime whitewater rafting. “We believe this project will be transformative. Don’t forget that word, because it’s going to be exactly that,” said Charlie Chandler, who chairs the board of directors of Franklin Savings Bank. After hearing multiple presentations about the project, the bank’s board voted unanimously to donate $250,000 toward making it become a reality; $125,000 has already been paid in. “The vision brought for this project is a vision for the city of Franklin,” Chandler said. Taylor Caswell, commissioner of the Department of Business and Economic Affairs said the whitewater park will be the first in New England. He described it as one more quality-of-life asset to tout as the state continues its efforts to attract new residents at a time when the state has more job openings than it does workers. Tim Morrill was among those who attended Monday’s announcement. “I came to show my support,” said Morrill explaining he enjoys kayaking and serves on the Mill City Park Board. Morrill is the seventh generation of his family to call Franklin home. His grandfather ran the boiler room at the Stevens woolen mill, the last of the big mills. It closed in the 1970s and burned in the 1990s. The giant iron wheel that is the centerpiece of Trestle View Park was the drive wheel that spun the belts that operated machinery throughout the mill, Morrill said. He cited an example of the paddling park’s economic impact, saying he has friends in Ashland who come to Franklin to kayak. When it came time for them to replace some furniture, they bought it at Grevior Furniture because the Central Street store’s founder donated the land for Trestle View Park. Interim Mayor Scott Clarenbach said the whitewater park is helping to renew the community’s sense of purpose and reenergize it. “Today’s gathering is all about Mill City Park at Franklin Falls which is writing a new and exciting chapter by reutilizing the power of Franklin’s beautiful rivers for another prosperous period in our community’s long history,” he said. The City Council was to vote during its Monday night meeting to formally accept the grant funds, Clarenbach said. "We need to rethink our vision of downtown. Look at Franklin. They have an organization there that’s been acquiring properties, not turning them into retail, but co-working spaces, restaurants, outdoor stores. They’ve applied for grants to study the construction of a new white-water rafting park, and they’ve got really good mountain bike trails. That stuff works..."
Return to the River Part 3: Recreation – and rebirth? On a given day, drivers passing Sanel Auto Parts and crossing over the Winnipesaukee River in Franklin may notice some brightly clad paddlers crashing through the current, mouths opened wide as cold water hits their faces. Floating past old mill ruins, beneath splintered trestle bridges and between overgrown sections of riverbank, Mill City Park Director Marty Parichand and others are generating momentum for a new reputation in the “Three Rivers City” – it’s the place to go for recreation. This is a rather evolved image for a former industrial city that once stunk to high heaven. Prior to the 1970s, raw sewage was dumped into the Winnipesaukee River by Tilton, Northfield and Franklin. More discharges flowed from failing septic systems throughout the watershed. Former Department of Environmental Services Commissioner Thomas Burack wrote in a report that in summertime, water consistency was described as “pea soup.” Fish kills, algal blooms and strong odors were common. The year after Stevens Company Mill closed, New Hampshire’s legislature voted to address the problem. They established the Winnipesaukee River Basin program in 1972. For two decades, the program worked with local communities to construct the Franklin wastewater treatment plant, 14 wastewater pumping stations and more than 60 miles of sewer lines. As effluent was gradually removed from the Winnipesaukee River, people began to appear, riding down the rapids. National Alliance on Mental Illness New Hampshire Executive Director Ken Norton – an avid paddler – said the annual “First Day” whitewater event in Franklin dates back to the 1980s. In the very beginning, it started with people floating down the Winnipesaukee River in tubes. To arm themselves for the chilly January air and freezing-cold water (and the general stupidity of what they were doing), Norton said alcohol, and not lifejackets, was the protective gear of choice. Norton, who lives in neighboring Tilton, helped organize a more formal event with the Merrimack Valley Paddler’s Club and the Friends of the Winnipesaukee River in 1981. There, Norton said he and a dozen more people paddled down the river. “Each year it sort of successively grew,” he said. Marty Parichand paddled in his first “First Day” in 2003. The Epsom native returned to Franklin more than a decade later to open his paddling business, Outdoor New England, and to start the nonprofit Mill City Park, which aims to create a whitewater playpark on a 9-acre parcel of city land along the Winnipesaukee River. Parichand envisions creating a place for people to come and paddle, ride mountain bikes and grow things in a community garden. Historic preservation of mill remnants is part of the plan, too. Parichand said the most expensive iteration of the park’s construction costs is estimated to be $4 million to $6 million. In return, a New Hampshire Department of Resources and Economic Development impact analysis shows a facility like that could bring $6.8 million in direct spending to Franklin on an annual basis. While the park is still very much in the planning process, the promotion of recreation in Franklin by Parichand and those before him have resulted in visible community change. The takeout spot for paddlers going down the Winnipesaukee, for example, is at Trestle View Park. In the 1990s, the restaurant formerly on that parcel burned, and in 2002, the Grevior family bought the land. They then gifted it to Franklin. A few years later, just across the street, the Winnipesaukee River Trail Association completed a walking path along the river. This past fall, Norton said that Northfield landowners Roger and Gloria Blaise donated a ¾-acre parcel of their property along Cross Mill Road so paddlers can have permanent access to the upper river. As recreation infrastructure has grown, so is its use. The walking trail is active, and Parichand has continued to recruit more paddlers. Franklin native Tim Morrill is one of them. After cruising the Winnipesaukee River on First Day 2016, the landscaping company owner said he’s taken more than a dozen trips since, and he’s now learning to guide a raft. “(It’s) a whole new adventure,” Morrill said. He gained a new hobby, plus friends from the experience. And he’s noticed the atmosphere in his home city change. Norton has seen it, too. “There’s a certain spirit that Franklin has, of people coming together that want the city to be more than a has-been of the city’s past,” Norton said. Norton was recently involved with a “Winnipesaukee Trail Clean-up Day” at the put-in spot for paddlers on Cross Mill Road. He said he and others have been working to improve the river since the 1980s. While the mill dams had been dynamited decades before, pieces remained – dangerous pieces. “(We) would just go down and we’d spend half a day cutting out the dam and pulling out the rebar and making the river safe,” Norton said. There was one particular loop of rebar they were determined to get out of the river – the loop was large enough to trap someone’s boat. “I have a friend who used to say he’d have nightmares about that loop,” Norton said. Parichand and the others behind Mill City Park are looking to finish the job, removing the rebar, cribbing and pipes that remain to improve safety for paddlers. “The riverbed would get an improvement,” Parichand said. The city of Franklin has made numerous attempts to revitalize its economy, its downtown, and its sense of community. But it was hard to find a central focus for those efforts, City Manager Elizabeth Dragon said. “It became really clear that, if we do a good job cleaning up the river and restoring the river, we have the potential to bring in 6 million dollars of new spending,” she added. The Mill City Park area is now incorporated into Franklin’s redevelopment plan being carried out by public-private partnerships. The next step is making sure the city can get the dam releases it needs on Winnipesaukee River from DES – two dams still sit on the river itself, with others upstream in the river basin. Franklin must also consider how to ensure the ecological future of the river that it’s looking to, once again, as an economic engine. “It gives us an opportunity to think of things differently,” Dragon said. He grew up on River Street, in the Three Rivers City, a short walk from the water-powered mill where his parents manufactured hosiery. The workers and machines of Sulloway Mills are long gone, now converted to the Franklin Falls apartment building. As a young man, Nadeau remembers his home city as vibrant, well-off and full of familiar faces – now he sees it as a center for renters and a downtown full of decaying storefronts. Developers, city officials and volunteers are attempting to change that, and they are gaining traction after years of effort. Franklin is just beginning a $400,000 downtown facade renovation. Nadeau wonders, though, if the mill city can ever recapture the wealth of its industrial past. It comes from humble roots. Like much of New England, the first white settlers harnessed the wilderness around them. They cleared tall pine trees for crop fields, raised farm animals, built homes and occasionally came into conflict with Native Americans. The History of Franklin author Alice Shepard describes these newcomers establishing Stevenstown in the 1740s, at what is now Webster Farm. To create their community, the settlers used water to power their first sawmill in Punch Brook, beginning a centuries-long history for Franklin’s mill activity. The Pemigewasset River would become choked with logs as a highway for the timber industry, Webb said, and the Winnipesaukee River’s drop toward the Merrimack River headwaters would grow particularly valuable as the population increased. Six paper and pulp mills were eventually built in the Winnipesaukee, with dams redirecting the water flow at six points along the river. Nadeau was born at the tail end of Franklin’s prosperity as a mill city, in 1931. “It gave a lot of people (the) chance to go to work,” he said. In addition to paper mills, wool and hosiery mills came into town, including Sulloway Mills, where Nadeau’s parents made socks and stockings. The textile operations lasted longer than the paper industry. Four decades after Franklin was incorporated as a city in 1895, the paper and pulp mills were all shut down due to labor strikes and the Great Depression, Nadeau said. In 1934, the dams were damaged by spring floods, then dynamited. As a child, Nadeau still experienced the benefits of Franklin’s industrial success. Webb said that in the city’s “gilded age,” Route 3A – the road to the White Mountains at the time – was busy, too. Gas stations, restaurants and souvenir shops lined the way. In warmer seasons, Nadeau said, there was always a weekend baseball game in Odell Park, and in winter, he would go ice-skating on a pond that used to be there. At one time there was even an in-ground public pool. The mills meant vitality for the Franklin community. Yet for the waterways, they created obstruction and filth. That was something Nadeau witnessed in his time. “Everybody was dumping into the river,” he said. Sewages, chemical waste, dye – anything undesirable. It wasn’t asphalt, but sludge and slime. Some people did swim in the Pemigewasset, Nadeau said, including his mother and father and their families. Sulloway Mills closed in 1953, and from there, Nadeau said, his father went right to the wool manufacturer, Stevens Company Mill. By 1971, that shut down too, emptying Franklin of its last operating mill. Since then, Nadeau has watched his home city change, from the struggling storefronts to the loss of the skating pond in Odell Park to the renters now filling the mill building where his parents once worked. “Today there are so many strangers,” Nadeau said. Webb, the historical society president, said Franklin’s decline is typical of any city losing its prime industry. One thing that has improved is the rivers. The water now runs clear, is unobstructed by the mill dams and no longer has raw sewage and industrial waste pouring into it. As the Three Rivers City looks for opportunities to revitalize its economy, the fast-flowing Winnipesaukee River is an attractive resource. It’s a whitewater paddler’s paradise, and, if everything comes together just right, it could mean an influx of desperately needed tourism dollars. Nadeau isn’t sure that will happen, but is rooting for his home city. “I’d like to see it,” he said. Beneath cool, overcast skies, Paul Pouliot took in the land, the river, the trees – all the geophysical features – of Franklin’s Odell Park. The chief of the Cowasuck Band of the Pennacook Abenaki People looked past the empty baseball field, the dilapidated mill buildings and the developed river banks. Eyeing the U-shaped bend where the river slowed, Pouliot knew – that’s where his Native American ancestors would have fished. He pointed to the spot just in front of the historic Riverbend Mill, under renovation for an affordable housing project. It was downstream from the river’s rapids, where local community partners are suggesting a whitewater play park can be installed to attract eco-adventure tourists and help revitalize New Hampshire’s second poorest city. The natural resource Franklin is turning to for its new lifeblood, Pouliot pointed out, is why people came to the area in the first place. Before it was known as the “Three Rivers City,” Stevenstown, or, informally, “the Crotch,” the land at the intersection of the Pemigewasset, Winnipesaukee and Merrimack rivers was frequented by its indigenous people. The History of Franklin by Alice Shepard notes that “the Crotch” is how Native Americans described the headwaters of the Merrimack River to Lt. William Miles, a 17th century scout from Canterbury. Present-day Franklin is just one spot in an expansive area inhabited by the Abenaki. It stretches across the province of Quebec, Canada, as well as Maine, New Hampshire, Vermont, New York, and Massachusetts. “The Native tradition – Abenaki tradition – is that native people have been here since the snows,” Stephen Berwick, a Concord author with indigenous heritage, said. The last glacial period ended 11,500 years ago, which is when other historians have the first humans inhabiting New Hampshire, too. Native American artifacts – tools, tomahawk weapons – have been found in several parts of Franklin, including Odell Park. Many of them are now kept at the Hood Museum of Art at Dartmouth College. There is evidence of that. In the “Indian Mortar Lot,” a small patch of grass along Route 3 in Franklin, a rock found along the Winnipesaukee River sits with a giant carving of a fish, thought to be a shad. According to a sign on the lot, the other boulder that sits there has a large mortar “first hollowed out by water, then by many years of apparent use of (Abenaki) Indians.” Fish like shad and salmon stopped coming up the Winnipesaukee River after dams were put in. Pouliot said in addition to abundant fishing, nut-bearing trees and berry bushes would have grown nearby, and the flat land along the riverbanks would have been perfect for agriculture – corn, beans, squash. “The early reports of what New England was like – it was like a garden,” Berwick said. Amid all the pine trees and growth, he said, trails following the rivers would be cleared by wildfire for hunting deer, moose and, in lean times, bear. Historical accounts and present day interpretations differ slightly on where exactly indigenous people would have pitched their wigwams, buried their dead and grown their crops. But all agree that on a consistent, seasonal basis, the rivers brought the early inhabitants to what is now Franklin. Pouliot said the Winnipesaukee River would have provided not only shad but salmon, alewife and eel. Standing on the present-day fishing pier off Odell Park, he was just a stone’s throw from where an old fishing weir made of sticks and stones was found in the water below Franklin Public Library. While Pouliot said indigenous people “over-fished the hell out of everything,” he added that none of their activities would have dramatically altered the landscape, or riverscape. They needed the rivers for fishing, bathing, medicine and transportation by boat. “Earth was sacred because they had to use it,” Denise Pouliot, a council member for the Cowasuck Band of the Pennacook Abenaki People, said. The Abenaki descriptions for these rivers – Pemigewasset, “swift current,” Merrimack, “deep river,” Winnipesaukee, “land around the lake” – have outlasted history. Their use, however, shifted dramatically when European settlers came to New Hampshire. Without immunities to diseases introduced by colonists, combined with conflicts with both Europeans and the Mohawk indigenous people, Abenaki in New Hampshire began to decline in the late 1600s. Those who survived either left for Canada, retreated to rural parts of the state or integrated with the new settlers. Indigenous people moved around based on seasonal resources for millennia, but colonists suddenly introduced the western idea of a fixed place and land ownership. What was once referred to by its geophysical description – “the Crotch” – gave way to Stevenstown, a land grant incorporated in 1768. That spot is now Daniel Webster Farm, which sits in present-day Franklin along Route 3A. Centuries of development and industry have altered the land, but one very basic element has always remained. Flying above Franklin, or looking at a basic geophysical map, the three rivers branching across the landscape still stand out. As one of the 1,000 or so people still living in New Hampshire with Abenaki heritage, Chief Pouliot still reads the water as his ancestors did. The Alton resident said he wasn’t familiar with Franklin, but as soon as he stepped out of his van in Odell Park, he could see the value of those rivers. “Just looking at this area – this is a major indigenous community,” he said. In his three decades of watching Franklin start and stop economic revitalization projects, Franklin Savings Bank President Ron Magoon said this time, something’s different. “In 29 years, this is the first time there’s been all the right people at the table,” he said. That includes city officials, local businesses, the nonprofit PermaCityLife and members of the public. Through collaborative efforts, new businesses have opened up downtown, an old mill building has been renovated for affordable housing, and plans have moved forward for a whitewater play park. It was with confidence, then, that Franklin Savings Bank bought a quarter of the $400,000 in tax credits New Hampshire Community Development Finance Authority awarded to the Franklin Business and Industrial Development Corporation in August. Franklin Savings Bank made its investment in February. Bank of New Hampshire followed with a $25,000 purchase, and just recently, Eversource Energy bought up the remaining $275,000. Now, that money will go toward facade improvements for buildings owned by PermaCityLife. They are slated to begin in July or August and last through the end of the year. “There’s been so much deferred maintenance in these buildings,” Todd Workman, PermaCityLife’s executive director said. Buell’s Block, Shepard Block and 337 Central St. will all get a facelift, though through the above mentioned partnerships, the work has already begun. Where once empty and boarded storefronts lined the bottom floor of Buell’s Block, new green-painted facades welcome visitors to a coffee shop and outdoor sports store. Across the street at “Toad Hall,” the former art gallery is being renovated into a tavern – new paint covered the tin ceilings Monday, and the large windows will be replaced within the month. All of these upgrades will continue with the CDFA tax credit money. More windows will be replaced in Buell’s Block, and the back of the building will have work done to make way for a brewery. At 337 Central St., the three storefronts there will get “a complete redo,” Workman said. This work is what moves PermaCityLife’s goals from planning to action, Workman said. And some of the organization’s permaculture ideas will become tangible, too: a “green roof” is part of the upgrade for 337 Central St. When businesses with rooftop gardens, a tavern, shops and a fixed up city center are noticeable to those driving through, City Manager Elizabeth Dragon said, Franklin becomes a place people want to be. Franklin has a number of long-held stigmas to overcome, but given all that’s already happened in the downtown, the community partners there are optimistic. “We have a lot of momentum building,” Dragon said. Workman regularly receives referrals for small businesses wanting to move to Franklin, and tradesmen, business owners and organizations already in the community are getting involved, too. From the Franklin Business and Industrial Development Corporation’s perspective, the hope is that in addition to retail businesses, a stronger downtown Franklin will attract a skilled workforce. It’s a future that seems a little closer, at least to Franklin Savings Bank’s Magoon. As efforts continue to build up downtown Franklin, a 15-year-old filmmaker, a high school engineering class and Colby-Sawyer College graphic designers and environmental scientists are pitching in to help. Area high schools and colleges are partnering with the nonprofit PermaCityLife to work on the laundry list of projects to make the city more attractive for businesses, tourists and new residents. In return for providing logos and “identity systems” for marketing, eco-park designs, ecological mapping and films – all for free – the students get something invaluable: work experience in a real, live community. “You just can’t replicate that just in the classroom,” Jen White, CSC sustainability coordinator, said. “It’s kind of like a win-win on both sides,” Jenisha Shrestha, the PermaCityLife community development coordinator, added. On a sunny February morning after some heavy snowfall, White grabbed a shovel and started scooping snow away from the old Hair Doctors storefront in downtown Franklin. White has overseen the creation of a new, three-year bachelor’s degree program in community-based sustainability. A large component of the major is hands-on work with different initiatives in the Three Rivers City, facilitated by PermaCityLife. This is the first year for the program. There are still some wrinkles to iron out, like getting a working heating system in the Franklin field studies office. After shoveling out the entryway, White and Shrestha went inside, where cubby work spaces, a sitting area, and a conference room are set up. “We had a couple meetings in there before it got really cold,” Shrestha said. Even without the office, however, she said about 90 CSC students were involved with the Sustainable Learning Initiative last semester. That number is slightly reduced for the spring semester. Some are in the new degree program, though others are just working in Franklin as part of their other classes. CSC junior Justin Rand and senior Zach Melisi are such students. “We both precede the major,” Melisi said. The environmental science major managed to get involved, though, after his original senior year capstone project fell through. White, his adviser, suggested he work with the Mill City Park initiative, a nonprofit planning a whitewater park in downtown Franklin, instead. Melisi is now in the midst of documenting invasive species along the Winnipesaukee River, and by the end of his project, he’ll make recommendations for site remediation. Melisi’s classmate, Rand, has also contributed to the Mill City Park initiative. His graphic design class held a logo-design competition last semester, and Rand won. Now, he’s volunteering with CATCH Housing to create a multi-dimensional identity system for the group’s new apartment project in Franklin. That includes a logo, signage and advertising materials. For both Melisi and Rand, there are real-life components in their projects that can’t be replicated in the classroom. Rand said it was a good lesson when his initial logo for Mill City Park was sent back to the drawing board not because his work wasn’t well-executed, but because his client didn’t like it. For Melisi, it’s instructive to do a live case study that incorporates ecological identification, land mapping and consideration of historic mill processes that affect the river. “It’s so different than reading about it in a book, when you can walk on the site and know lead and arsenic are leaching into the water,” he said. Yet another project for Mill City Park is being conducted by a class at Tilton School. Engineering and chemistry teacher Tyler McDougold said he read about Parichand’s idea for the whitewater play park in the Monitor last summer, and he saw the opportunity for his students to do some hands-on work using critical thinking. His environmental engineering class began their project, designing the proposed “eco-village” for Mill City Park, in the fall. They spent their first school quarter learning what “design thinking” is: defining problems, identifying criteria and constraints for addressing the problem, developing and analyzing solutions and then getting feedback. In their second quarter, the class got to work. They spoke with Mark Hayes at Highland Mountain bike park in Northfield, for instance, and learned that he often has people sleeping overnight in his parking lot because there aren’t other nearby places to stay. The class has also examined how sewer lines can be hooked up to the Mill City Park area. By the end of the year, McDougold expects to have the backbone for the eco-village project done. While the Tilton School students might have to wait years before seeing the payoff, 15-year-old Hank Miller does not. The Proctor Academy freshman did his first professional film shoot in February. Miller helped the nonprofit apply with an arts grant, filming a 2½ -minute video for their application. He interviewed Jo Brown at the Franklin Studio, and Joseph Kildune, the local car-parts sculptor, about how artwork has boosted both business and opportunity in Franklin. He, on the other hand, already has a business, called Hank Miller Productions, and definitely knows what he wants to do after school. “I want to pursue this as long as I can,” he said.. I rode backwards down a ski hill in a kayak. On Saturday, you can too. This job has landed me in some pretty peculiar circumstances. They range from holding a pig to eating meat from the same pig months later, listening to a state senator’s soliloquy about firecrackers, and walking in the woods with a Chichester woman who was wearing nothing but shorts and a sports bra in the middle of January. Then on Friday, I went kayaking down a Franklin ski hill. Outdoor New England owner and paddler Marty Parichand lent me a boat for a “test-run” before today’s Boat Bash Snow Crash event at Veteran’s Memorial Ski Hill. For 12 hours, people can sled using kayaks provided by Parichand or canoes provided by Blackfly Canoes of New Hampton, listen to music, visit vendors and, starting at 3 p.m., compete in a downhill elimination race. Parichand, who is holding the event in conjunction with the Franklin Outing Club, said it’s the first of its kind on the east coast. Only people in Colorado and Europe, apparently, have figured out before now that cruising downhill in a boat is actually a great idea. A fact-check seemed important for this story. As Parichand led me over to a boat and handed me a helmet to squish on my head, I had another peculiar, though not uncommon, experience on the job: one of my best friends from high school pulled up in her car. Orli Gottlieb, who is an engineer, fellow Bow High School alum and a board member for Parichand’s nonprofit whitewater park project, Mill City Park, agreed to sled with me. (She also became my iPhone videographer). Snowmobiles and a T-bar will be up and running for the actual event, but we had to walk up the ski hill with our kayaks Friday. After slipping our way over some icy patches, we found a spot with reasonable elevation, and not in the immediate trajectory of anything we could hit. (There was a big snow pile at the bottom of the hill – insurance, Parichand told me, just in case someone reaches top-end speeds). Orli and I sat into our short kayaks, though my winter boots made it difficult to get my legs bent enough so they were completely inside. I didn’t have a paddle – I needed my hands to hold my camera. “With a paddle you’d be able to control which end is going forward,” Parichand told me. I shrugged like the amateur I was. Orli expertly managed to balance both paddle and my iPhone, and she scooted her boat forward first. I followed – rocking back and forth with perfect muscle memory from my childhood sledding days – and off we went. I rode backwards, giggling, for half of the hill. But all’s well that end’s well: I finished my run with grace, sliding in smoothly – and frontwards – next to Orli. There was more giggling after that. We did just a small portion of today’s course. Parichand told me there would be two tracks side-by-side for the races, though before those could be made, they needed a whole lot more snow after the past few weeks of warm temperatures. The Veterans Memorial Recreation Ski Area has never made its own snow. But with donated hoses, compressors and snow gun stands, the retired Franklin Fire Department member and “Goddamned genius” Alan Carignan, and half a dozen volunteers, it was possible. Getting the hoses connected right, controlling for the best pressure, and stopping the snow guns from tipping over (and spraying my entire pantleg) took a little while. But by 4:30 p.m. Friday, Parichand and his crew were making snow. They expected to cover the hill in 8 to 12 inches throughout the night, with some time to spare to construct the race course. Parichand and his crew have been working long hours to make the Snow Bash Boat Crash come to fruition. They only got the snow makers functioning correctly at 1:30 a.m. Friday morning, and they weren’t sure how much sleep they would get, if any, the night before the event. With proceeds from the event going to both the Mill City Park project and the Franklin Outing Club, plus the general momentum for outdoor sports and downtown development in Franklin, Parichand told me he’s okay pulling all-nighters to make some snow. “There isn’t anything I’d rather be doing,” he said. The Boat Bash Snow Crash will run from 10 a.m. to 10 p.m. today. Entry just to watch is $5 per person, $20 to sled, and $25 to sled and race. Slowly but surely, the city of Franklin is undergoing a transformation. The goal: to become a tourist destination for outdoor enthusiasts and a home to millennials looking to make an impact on their community. Renovations are in the works to turn the former art gallery Toad Hall into a restaurant by this summer. Just last fall, a team of engineers inspected the future site of a whitewater park. CATCH Neighborhood Housing is in the midst of renovating a foreclosed mill building into 45 affordable apartment units. And that’s just naming a few of the happenings occurring in the city of approximately 8,400. For decades, Franklin has made efforts to rewrite its history as a failing mill town, but this movement is even more crucial. With significant revenue shortfalls in recent years, the city must draw in new income or else face an even more dire future. It’s an all-hands-on-deck effort, with regular biweekly stakeholder meetings, a team of students from Colby-Sawyer College in New London and a number of active residents stepping in to volunteer their time and energy. Integral to the effort are seven properties owned by PermaCityLife, a nonprofit founded by Todd Workman. Raised in Gilford and having worked in the financial services industry in New York and across New England, Workman initially returned to the area to tend to his grandparents. 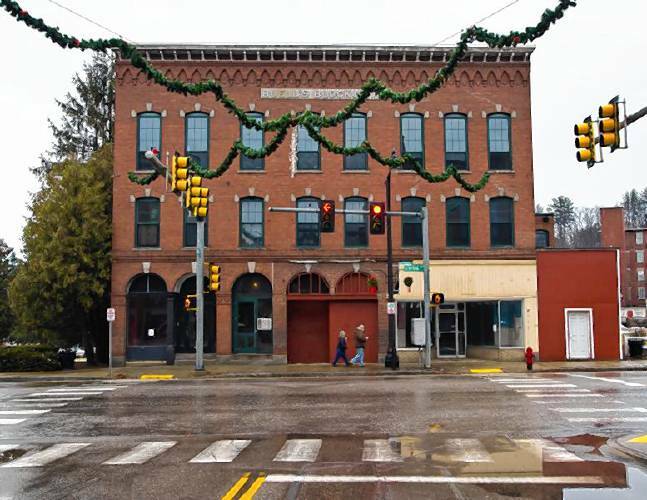 He was browsing real estate properties in New Hampshire when he came across Franklin and started purchasing buildings along Central Street in 2014. Workman envisions Franklin as a sustainable community – protecting drinking water, creating renewable energy, ensuring local food supplies and implementing zero-waste measures – with a vibrant micro-urban centerpiece. During the summer of 2015, Workman met Marty Parichand, a whitewater rafting guide and former avionic systems programming specialist who envisioned opening the first whitewater park in New England. Parichand, who is from Epsom, had been setting his sights on Concord, but immediately saw potential in Franklin. “The concept is new for New England, but there are 30 of them in Colorado, 280 across the country,” says Parichand. He was surprised at how knowledgeable Workman was about the whitewater paddling industry. Parichand then started his nonprofit, Mill City Park. He wants to use a tract of city-owned land along the Winnipesaukee River for a launching spot as well as create a mountain bike pump track, a community garden and an eco-village-style campsite. In 2015, Parichand worked with the state Department of Resources and Economic Development on a report that found Mill City Park would bring in $6.8 million of direct spending in the region. “We have many challenges here in Franklin, and we believe this whitewater park is our second identity,” he says. In one of PermaCityLife’s buildings, Parichand opened up an outdoor recreation shop, called Outdoor New England. Like many of the buildings, it had been condemned. Parichand says he removed 12,000 pounds of trash and demolition debris, and paid out of pocket for the mechanical and electrical systems. Today, you wouldn’t know of the building’s grim past. The shop has a charming look from the reclaimed wood and old cabinetry. Next door is a volunteer-run coffee shop, led by Jo Brown. Brown approached Workman with the idea. She brought in family and friends to clear out the space – a labor of love. The quaint shop is run mainly by retirees who are happy to take on a four-hour shift. Its success led to a wall being knocked out to allow for a gift shop all of whose offerings are products made in New Hampshire, a majority of which are created by local artisans. Across the street is Toad Hall, Take Root Coworking – a shared coworking space with a fiber connection providing faster Internet than Franklin Savings Bank, it proudly proclaims – Franklin Clothing Company and Colby-Sawyer’s satellite campus, where Workman will also operate PermaCityLife from. Last fall, Colby-Sawyer launched a three-year degree in community-based sustainability with a focus on gaining real-world experience through working with PermaCityLife, Mill City Park and the city of Franklin. “Students learn about sustainability, and not just how that applies to communities, but also to organizations and nonprofits,” says Jennifer White, sustainability coordinator for the college and assistant professor in the environmental services department. It’s not just students in the degree program who have the opportunity to work with Franklin. In 2015, Colby-Sawyer launched a Sustainable Learning Initiative, giving all of its students the opportunity to pair with individuals in Franklin to complete a to-do list of sustainable revitalization efforts. One graphic design student created the logo for Mill City Park. He’s now working as an apprentice with CATCH to develop an identity for the future apartment complex. Franklin Clothing Company Owner Matt Charlton-Nidey stands outside his storefront on Central Street. When asked whether student involvement could make students interested in staying in the community, White thought it was a possibility. While on winter break, a group of students in the degree program attended a city council meeting of their own accord. “It’s a great example of a local community taking it upon themselves to do something different and stick with it,” says Michael Bergeron, business development manager for DRED. The agency has helped organize various state players, including connecting Parichand with the state Department of Environmental Services to discuss dam releases that affect the Winnipesaukee River in Franklin. “By attracting a young demographic who want to whitewater raft and do mountain biking, they will change the character of that community and make a difference long term,” says Bergeron. Vital to Franklin’s revitalization are the variety of financing options. Through the “Franklin for a Lifetime” series, the city learned about USDA Rural Development grants. It received a $50,000 Rural Business Enterprise grant the city used to hire downtown coordinator Niel Cannon to work with the steering committee to find and carry out projects that help low and moderate income families. The city also received a $500,000 Community Development Block Grant for CATCH Neighborhood Housing’s mill renovations – a small piece of the $12 million project – and $400,000 in Community Development Finance Authority tax credits, a quarter of which Franklin Savings Bank purchased, which will be used to make façade improvements on PermaCityLife-owned buildings. Franklin recently incorporated the land intended for Mill City Park as part of its TIF (tax investment financing) district. The city created the district – which comprises much of downtown – in 2008. If a building within the district is renovated and taxes increase, a portion of the increase is reinvested to projects in the same district. “It’s very unique. Every community with TIF districts has to say what the projects are, how much of the new incremental value will be reinvested in that area of the community, and they have an advisory board to oversee and goes back to the city council for approval,” says Dragon. Meanwhile, the city has seen significant changes with the opening of eight new businesses in downtown Franklin over the past year. FRANKLIN — The East's First Annual Dual Snow Kayak Race will be held on Saturday, March 4, at the Veterans Memorial Recreation Ski Area at 361 Flaghole Road in Franklin. The day-long festivities begin at 10 a.m. and run until 10 p.m.
Activities include the active participation in the sport of downhill kayaking, optional dual racing, or just enjoying the event as a spectator. Day- and evening-long entertainment will feature race events and prizes, live music, silent auction, raffles, kayak vendors and concession sales in the ski area's lodge, and more. "The Franklin Outing Club Winter Carnival is excited to be adding such a unique sporting event to celebrate its 55th Winter Carnival," said Kathy Fuller, Franklin Outing Club board member. "We enjoy attracting new families to the Veterans Memorial Recreation Ski Area and this first annual event is the perfect way to see many new smiling faces adorning the mountain." "Those involved with the creation of Trestle View Park understood the interaction between whitewater kayakers and the City of Franklin," added Marty Parichand of the Mill City Park at Franklin Falls. "This Winter Kayaking Event is the next step in that relationship. The event will be a fun and music-filled afternoon for all to enjoy with the benefits supporting the Franklin Outing Club and Mill City Park. This kayak sledding experience is the only one of its kind on the East Coast, which will surely have people of all ages attracted to Franklin's Veteran Memorial Recreational Ski Area." Admission prices are: $5 general entrance fee, $20 for admission and snow kayaking from 11 a.m. to 3 p.m. (before the official races begin), and $25 to enter dual races (starting at 3 p.m.). For insurance purposes, kayakers under 18 years must be accompanied by a parent or guardian at all times and all kayakers will wear helmets and sign a release of liability agreement. The event proceeds will benefit the Franklin Outing Club and the Mill City Park at Franklin Falls nonprofit organizations. To become an event sponsor, email timothymorrill13@gmail.com. Established in 1960, Veteran's Memorial Recreation Ski Area is a volunteer recreation area run by the Franklin Outing Club. The VMRSA has been holding Winter Carnival events to celebrate this community resource and serve as a fundraiser since a year after the Area's opening. Recently, the VMRSA has expanded its year-round recreational opportunities to include such activities as affordable skiing for families; free skating; free snowmobile and cross-country skiing trails; disc golf; hiking, biking and walking trails; and more. You can learn more about the Veterans Memorial Recreation Ski Area by visiting www.veteransskiarea.com or www.facebook.com/veteransskiarea, by calling Ellen Coulter at 934-0148. Established in 2016, Mill City Park at Franklin Falls is a nonprofit adventure park with plans to create a whitewater park, mountain bike pump track, community garden, historic mill ruin trail and event space. Mill City Parks' purpose is to create an iconic outdoor community park through environmental restoration, historic preservation, community sustainability and economic development initiatives. Mill City Park will consist of New England's first whitewater park and mountain bike pump track free for people to use and able to host national and international amateur sports competitions. The park will also include a community garden and historical mill ruin trail providing learning and charitable food opportunities for the region. Learn more about the Mill City Park at Franklin Falls at millcitypark.com, by calling Marty Parichand at 931-4775, or by visiting www.facebook.com/millcitypark. Franklin future: Is it the river? Franklin has formally decided to incorporate the Winnipesaukee River into the city’s economic future. City councilors voted last week to amend the 2008 “Franklin Falls Mixed Use Tax Increment Finance District” to include a large chunk of city-owned land along the river banks. The district, now just over 99 acres, already covers Franklin’s dense downtown area on Central Street and the property where shuttered mill buildings still sit. In a tax increment finance (TIF) district, property taxes on future assessed value are set aside for redevelopment projects within that area. Because the city owns the riverbank land, however, that property isn’t taxable and doesn’t bring in additional money. At least one city councilor said for that reason, the area shouldn’t be included in the district. But as the city looks for more public-private partnership projects to boost its downtown, the river is the site for one of its promising efforts: a whitewater play park. Outdoor New England whitewater retail and service business owner Marty Parichand came up with the idea. Over the summer, he proposed taking the 9.3-acre overgrown former mill site and installing whitewater paddling amenities there. Parichand has promoted the project as a way to help the city as a whole. A New Hampshire Department of Resources and Economic Development impact analysis shows a facility like that could bring to Franklin $6.8 million in direct spending on an annual basis. In addition to drawing in visitors to eat, stay and spend money in Franklin, Parichand said the sports themselves – whitewater rafting and mountain biking – are opportunities for vulnerable children to have positive experiences. “Anyone with a kayak and a bike and pair of legs would be able to enjoy this land,” he said. Parichand noted kids are also positively impacted by the economic growth aspect, which could create more tax dollars for education – something Franklin desperately needs. The school district there had to enact a budget freeze in the fall and consistently struggles to fully fund its education costs. “In other locations whitewater parks have been so successful . . . they’ve opened new schools and they’ve named them after the whitewater park,” Parichand said. At this point, Parichand recognizes he has a big project on his hands. But it seems to fit well with the place he’s trying to do it in. Elizabeth Dragon, the city manager, sees it that way, too. With the suggestion of both restoring and reusing the river, plus redeveloping the old mill sites, Dragon said there seems to be a coming together between Parichand’s whitewater vision, PermaCityLife’s downtown development efforts, and the community’s vision of what it could be. City officials have become more organized in responding to development ideas in the process and have had regular “economic development” meetings in recent years, too. For the whitewater project, the city approved an application for $12,000 in Community Development Finance Authority planning study money in October. That application has since been withdrawn due to engineering work having already begun on the site, but Dragon said Franklin is looking for funds elsewhere. If worse came to worse, she added, the city could re-apply for the same money during the next round. In the meantime, Parichand is in the last steps of forming a nonprofit for the project. He is also learning how Mill City Park can be accomplished in phases – a suggestion from Franklin officials. “We’re in the process of getting a better understanding of the construction of all these pieces,” Parichand said. Parichand said he has met twice with various state and federal agencies to make sure historical materials, the environment and the city’s land are all used appropriately. When those studies are done, he added, the next task will be cleaning up. “Earth has really taken the land,” Parichand said. City Councilor Jim Wells was the lone voice last week saying that land should be left to the earth. He was the only “no” vote on the TIF district update. In addition to Franklin having other pockets that could benefit from TIF funds – the upper part of Central street between the downtown and the Tilton line, for example – Wells said he didn’t think the whitewater park was feasible. “I don’t think that they can put that project in there and meet all the requirements,” he said. Wells said he was concerned that the historical mill remnants as well as environmental considerations could act as barriers. Wells said he also couldn’t see where exactly people visiting would spend money, since there aren’t many motels or restaurants left in Franklin. “There’s not even any parking for these people,” Wells said, indicating the rural, back road in Northfield where most paddlers hop into the river for a whitewater run. But Parichand argues that because the project is a non-traditional development, that could make it successful – with a lot of help.